User's story 1: Soil conditioner | IBE TECHNO CO.,LTD. Mrs. Hatsumi Inaba runs a shop of IBE product named "Inaba Salon" in Hikawa-gun, Shimane prefecture. She married at the age of 23. After moving from place to place in Japan because of the transfers of her husband, she returned her hometown at 37. At that time, she found that the scenery of the hometown has begun to disappear. In her childhood she was surrounded by green mountains and clear waters in rivers and lakes. The fields were rich in green. In early summer she could see fireflies around her house. "There will be nothing left for children if we do nothing now. I want to leave children something links up the thought that here is my hometown." First she began to spread "Super AKANE" a soil conditioner to a river near her home. A few years later the red water in the river became transparent and spiral shells which are a food for larvae of fireflies began to live there. Mrs. Inaba explained to her neighbors and asked their cooperation to expand the area to spread "Super AKANE" It was only a few pieces of fireflies that observed when she returned to Shimane prefecture. The number of them has increased year by year, like 50, 100, 300, and more…. One day in early summer her son saw a big swarm of fireflies during a walking and praised his mother smiling all over, "How great you are, Mom!" She feels very happy when people in her town thank her for restoring fireflies. The scenery of her hometown shall be taken over to her children and grandchildren through pretty lights of fireflies. When she calls "Yoo-Hoo! 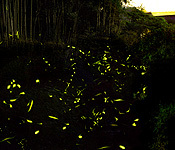 ", many fireflies gather. It is the same scenery in her childhood. She wants to expand the movement to all over Shimane prefecture and all over Japan. Farmers began to use "Super AKANE"for their field cultivation in her town and neighbors. 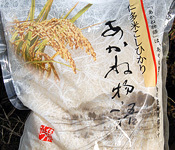 The sweetness of the rice crop made with "Super AKANE"was 86 percent, whereas that of conventional rice was 80 percent at the highest. Lake Shinji, a picturesque of Shimane supports lives of the people in the district. Mrs. Inaba says, "To keep rivers clean is to keep the lake beautiful. I want to leave this precious nature to coming ages." Mrs. Inaba (left) and her friend : People around her begin to support her steady activity. · Soil conditioner "Super AKANE"
· User's story 2 : Soil conditioner "Super AKANE"